Arrieta decries charisma shortage in peloton. 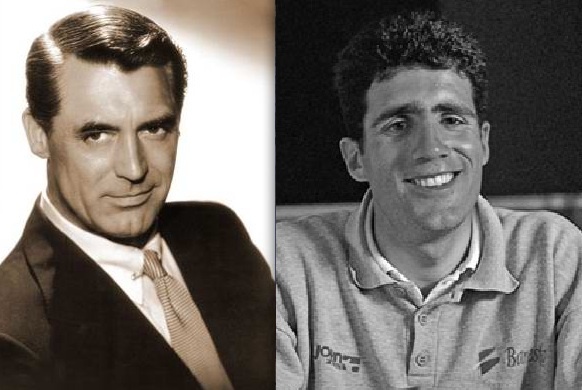 Where’s our Cary Grant? Jose is not seeing stars. José Luís Arrieta of Ag2r-La Mondiale has spent 18 years as a professional rider. He’s seen the great riders of the sport and worked as a domestique for Indurain, Zulle and Valverde. According to Jose, part of cycling’s woes is that there aren’t any stars anymore. Perhaps there’s a nugget of truth in there but it sounds like old Hollywood types complaining there’s no Clark Gable or Cary Grant these days. That glamour somehow died when Marilyn Monroe and Ingrid Bergman left the silver screen. My God, haven’t they seen Brad Pitt’s goatee? Have they no understanding of Angelina Jolie’s pouty lips. Does George Clooney have no stage presence; is Julia Roberts just a nobody? Wait a minute, maybe Jose is right. Arrieta claims that Miguel Indurain was loaded with charisma but if memory serves most journalists said he was one of the dullest interviews in the history of cycling. Is Jose saying Armstrong isn’t a leader? That skinny little Andy Schleck isn’t as quotable as Alex Zulle? That Alejandro Valverde’s character and personality could carry a Hollywood blockbuster better than Tom Cruise? We’d like to see him try Mission Impossible 2 — although that sounds like Valverde’s doping case at the Court of Arbitration in Sport. What’s Arrieta trying to get at here? Is he saying the Alberto Contador doesn’t have the same A-list luminosity as fellow Spaniards Antonio Banderas or bad man Javier Bardem? Sure the old bosses and patrons from bygone days are gone. The race bikes are lighter, the energy bars taste better and the stars have changed. Twisted Spoke has charisma running about the same as always. « Boonen wins stage 5 in Tour of Qatar. The commemorative thong.